greater in Arizona and especially southern Arizona than is generally understood. While Arizona doesn't have the steaming geysers found in Yellowstone and to lesser extent in Nevada and Utah, there is substantial heat flow that could be tapped. 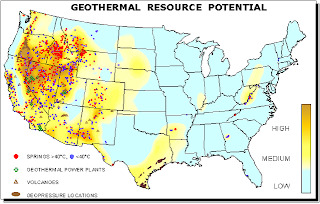 Arizona geothermal potential is more in the low to medium temperature range, which is excellent for geothermal heat pumps and space heating, rather than electricity generation that requires the higher temperature resource. Particularly encouraging is the Arizona Corporation Commission's proposal to establish a 15% Renewable Portfolio Standard for the state. That would require regulated electric utilities to get 15% of their electric generation from renewable energy resources. The old standard was one of the first in the nation, but set at only 1.1%. The old standard excluded geothermal energy but the new one includes it. The proposed RPS is in review by the Attorney General. It "carves out" 30% of the total requirement from distributed generation and includes thermal energy, for heating, cooling, or hot water. This means that the use of geothermal for greenhouses or residential/commercial heating and cooling would qualify. Thus, Arizona utilities could be expected to support these kinds of projects financially, to help meet their RPS commitments. 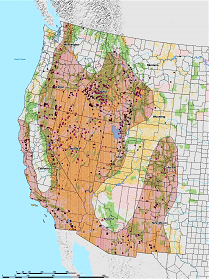 One reason Arizona is not viewed as attractive as some other areas, according to Joel Renner with the Idaho National Engineering Lab, is that the old USGS assessments only considered resources above 3 km (roughly 10,000 feet) depth. We also have not seen any reservoir stimulation at commercial scales yet. This is what used to be called "hot dry rock" geothermal. The key element of "Enhanced/Engineered Geothermal Systems" (EGS) is moving water through hot rock. The near-term goal of this program is to improve the productivity of existing geothermal fields. Paul Morgan, formerly of NAU and recently moved to the Denver Museum of Nature and Science, reported that the water geochemistry infers that reservoir water temperatures of 180-212 degrees F (76-100 C) are widespread in Arizona, and temperatures of 213-300 F can be found. Jim Witcher, consultant from New Mexico, noted that geothermal energy is produced 24/7 compared to solar (needs the sun) and wind (which needs the wind to be blowing). This allows geothermal to be built into utilities base load capacity. Jim also suggested geothermal heat could speed up chemical and kinetic reactions such as improving the speed and efficiency of copper leaching, an issue of great importance to Arizona. No one has tested this concept. One reason is that the geothermal research budget in the federal budget is zeroed this year. The existing programs in the Dept of Energy and National Labs have been told to close down their programs. Last Friday, the Senate approved continuing the funding for the remaining 5 months of the federal fiscal year (through September) but it's unclear if the House will agree. Word from DC: "All climate, all the time"